MROSD area superintendent Brian Malone shows off the Miramontes Ridge viewpoint. Photo: Autumn Sartain. At the top of Miramontes Ridge, there is a viewpoint that people aren’t allowed to visit. Brian Malone, area superintendent for MidPeninsula Regional Open Space District (MROSD), takes me through locked gates, past an “Area Closed” sign, and over an overgrown road to get there. On this clear day in early May, the view extends over rolling chaparral hills to where the Pacific Ocean nestles into Half Moon Bay. From the ridge top we can even see San Francisco Bay and the outline of downtown San Francisco. Two red-tailed hawks fly over hills below us, while an ocean breeze and sunshine puts smiles on our faces. That may soon happen if voters in San Mateo, Santa Clara and parts of Santa Cruz counties approve Bond Measure AA in the June 3rd election. Miramontes Ridge and MROSD’s other open space preserves would have the necessary funding to provide some public access. For the majority of MROSD’s 42-year life, its main focus was on land acquisition. But the agency has broader goals. “Our mission is acquisition, it’s restoration and it’s public access — it’s really those three elements,” said MROSD’s general manager Steve Abbors. In 2011, with increasing demand for public access, MROSD devised a vision plan and assessed potential wildlife corridors, regional trail access, and spots where sensitive species, water resources, and old growth forests needed protection. From this, it identified 74 different project areas, and with public input winnowed those projects down to a top 25. The agency priced them at $300 million and has asked the public’s support with a general obligation bond funded by property taxes starting at $1 per $100,000 of property value. The taxes would peak by year 20 at $3.18 (that amounts to $31.80 a year for a one-million dollar home). “We designed it to be affordable. We designed it to really listen to what the public has to say,” said Abbors. A community oversight committee would report to the board and publish how the funds are spent so the public gets accountability. “We really enjoy a wonderful quality of life here and a big part of that is having these incredible jewels of scenic beauty here, very close to home, and we want to keep it that way,” said Marc Landgraf, external affairs director for Peninsula Open Space Trust (POST). POST is sponsoring the campaign for Measure AA, providing funding, staff time, office space and volunteer organization. For the Measure AA to pass, it needs a two-thirds vote of approval in Midpen’s jurisdiction. While acquisition is still an important piece of Midpen’s Vision Plan, accounting for 50 percent of the dollar value from the Bond, another 50 percent will go toward providing more public access, including trail-building and other recreational infrastructure. Funds will also be devoted to restoring and managing resources, which could include conservation grazing, fisheries management, and enhancing ponds for sensitive species. While the bond money would be used to implement projects, maintenance costs would come from their existing budget, according to Abbors. This could be a big win for the public, since 44 percent of Midpen’s lands are currently closed, including most of the 19,000 acres of Sierra Azul that surrounds the Peninsula’s highest peak, Mount Umunhum. But with the bond funding, every major land holding will eventually open, in part, to the public. The 1,152 acres of Miramontes Ridge is a high priority for public access. Mostly chaparral from Skyline Blvd down to Half Moon Day, the land also includes agricultural fields and coastal prairies. It has rare plants and sensitive species, such as steelhead trout and red-legged frog. Projects would include stream restoration as well as public access. In addition to people, MROSD is also interested in re-introducing cattle to their lands. On its La Honda property about 10 miles southeast of Miramontes, the vision plan includes opening the Driscoll Ranch area. Conservation grazing began there in April when the Markegard family brought in the first cattle in 17 years. “The new trend in science and research is that bringing cattle back onto the land in a managed way is actually beneficial to these grasslands, because that’s how these grasslands evolved, with grazing animals,” said Doniga Markegard, co-owner of Markegard Family Grass-Fed. 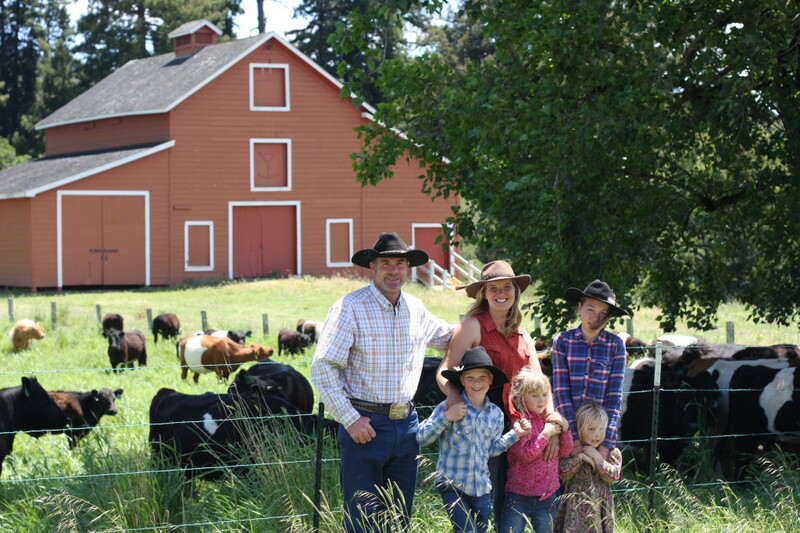 The Markegard family also leases land from POST at its Cloverdale Ranch — a coastal area also included in Midpen’s vision plan. POST and Midpen hope to open up even more land for conservation grazing as less than 1,000 of 3,260 acres of grasslands at Cloverdale are currently leased. Trails and habitat restoration would also be added. La Honda includes a priority watershed for coho salmon according to Lenington. There, the vision plan includes stream restoration to remove barriers to fish migration. It also includes fire management, building trails, putting on community events, and habitat restoration for red-legged frog. Landgraf says that Cloverdale has, “one of the healthiest populations of San Francisco garter snake in its range.” There, habitat improvements are planned for the snake, as well as steelhead trout and red-legged frog. Other projects would include trail building and agricultural interpretive programs. If the bond fails, Abbors says Midpen will move forward on the vision plan anyway, but progress will take much longer and some opportunities would be lost.